"If I have to tolerate what these guys do at their little festivals and functions, why don't they tolerate what I do?" Councilman Mike Fagan says about his left-leaning critics. 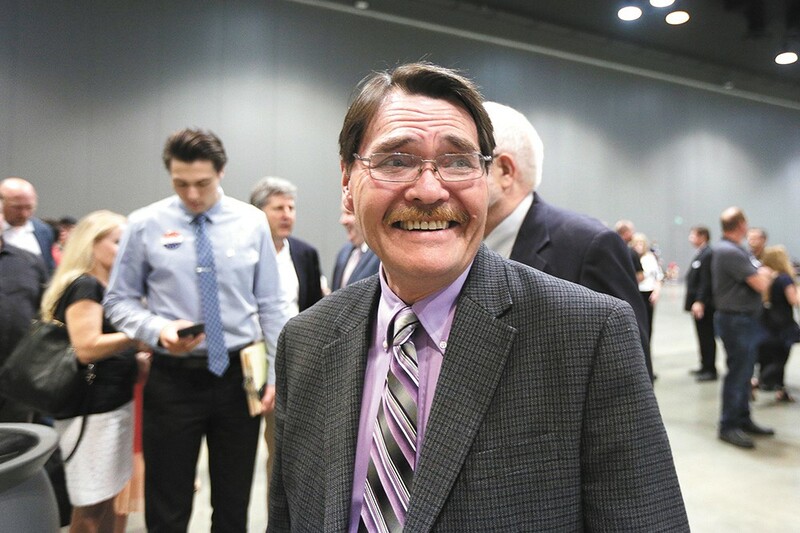 In that moment, John Lemus, the head of Spokane's Human Rights Commission, decides that enough is enough. Study after study indicates that immigrants, legal or illegal, are actually less likely to commit crimes than native-born Americans. But the violent imagery that Councilman Mike Fagan uses in attacking illegal immigration at the city council meeting last month paints the opposite picture. First, Fagan suggests that illegal immigration is to blame for the heroin epidemic. Then he starts describing, in graphic detail, crimes committed by "illegal aliens" in the area. He points to a brutal murder in Grant County, the torture of a drug dealer from Spokane, and describes how an "illegal alien... bludgeoned his girlfriend to death before stabbing her in the chest with a screwdriver, before he got arrested on the highway walking with his baby." Council rules say that Lemus is not allowed to boo or yell in response. Instead, he stands up and turns his back on Fagan as he continues to speak. Seconds later, he's joined by his two fellow commissioners, Nicole Bishop and Ashley Torres. They leap to their feet and turn their backs on Fagan as well. For Bishop, the protest wasn't a message aimed at Fagan, so much as his targets. "It was a way to show solidarity to those who his words might have hurt," Bishop says. It wasn't Torres' first act of protest that evening. As a Boy Scout troop led the crowd in the Pledge of Allegiance to kick off the meeting, she sat in silence. She doesn't believe that America offers "liberty and justice for all." She doesn't believe that her patriotism is tied to the Pledge of Allegiance. Boycotting the flag was what really incensed Fagan, a disabled Army veteran. "I really appreciate the fact that we've got people who have ended up turning their back on me," Fagan says, his voice building in volume. "At least one of these individuals didn't have even have the decency and the respect while the American flag was being posted, and we were saying our Pledge of Allegiance." The fallout from Fagan's controversial comments — and the HRC protests — hasn't just sparked debate over the content of his words, it's caused activists to examine another question: What's the most effective way to respond when a person in power says something offensive? For Fagan, it wasn't even the first time he'd been the subject of protest and outrage in March. After the Inlander published its story about a Spirit of America rally in Spokane Valley on March 4, critics quickly seized upon two jokes that Fagan made as part of a mock radio-show performance. To anyone not convinced that the state should reverse a rule allowing transgender individuals to use bathrooms of their choice, Fagan told the crowd, "I'll be more than happy to follow you into the bathroom and see how you feel about that." He also projected a picture of city council candidate Kate Burke standing beside Bill Clinton, then said, "You know, I first looked at that picture, and the first thing that came to mind is, 'Hey, where's Bill's hand?'" Today, Fagan takes out a sheet of paper from his desk to show the Inlander a printout of the Facebook conversation where Burke first posted the picture. "The lead-off comment is, 'Where's his other hand?''' Fagan says. "If there's any heartburn here, it's that I stole somebody else's joke." The online outrage has been swift and immediate, with dozens of commenters hammering Fagan on Facebook. Three weeks later, Fagan found himself in the middle of another Facebook flame war. "Mike Fagan, when your own city Human Rights Commission turns its back on you during your horrible testimony on a human rights ordinance you know that there's a problem," Lemus wrote on Facebook, tagging the councilman. "Your testimony was not representative of the compassionate city we are building." He brought up the time that former HRC chair Blaine Stum had raised concerns about the police department's response to an alleged assault of a transgender woman in 2015. Ultimately, an internal affairs investigation cleared the police of wrongdoing. "I asked for a public apology in light of what SPD was going through then, and all I got was 'CRICKETS,'" Fagan wrote. On Lemus' Facebook page, Stum leapt into the fray, repeating the arguments he'd made three years ago. "You asked for an apology regarding something [the Human Rights Commission] didn't say or do, namely denigrate SPD," Stum responded. Spokane County GOP chair Stephanie Cates suggested to Lemus that when the HRC members turned their backs, it gave the impression that they weren't listening. Lemus says they were listening, but understands where Cates is coming from. "But the Human Rights Commission also has a mission to protect human rights in the city," Lemus says. "What do you expect me to do, clap for him?" Ultimately, after days of social media salvos, Lemus began to reconsider his methodology. Perhaps his protest had been a distraction? "Instead of everyone seeing and remembering our amazing [Human Rights Commission] workplan for the year that we presented that evening, the focus is now on something that's not positive," Lemus wrote on Facebook. "I promise that I will use better judgment to protect the commissioners and our work in the future." In some ways, Fagan's background could make him more sympathetic to the concerns of immigrants, minorities and transgender people. He describes his family as a "rainbow" with Native American, black and Hispanic members. He says he has a family member who was born as intersex — with male and female genitalia — which has caused him to spend a lot of time thinking about transgender issues. His mother, he says, was a Japanese immigrant, making him half-Japanese. "I'm the only minority on the council," Fagan says. "I grew up a 'half-breed.' I was teased. Nowadays they call it bullying... My last name was Fagan. Can you imagine what kind of fun I went through in school?" So why, with those experiences, does Fagan take the positions that he does? Some of it, he says, is backlash, based on how he's felt treated by the other side. "How's that adage go? Once bitten, twice shy," Fagan says. "I've been bitten more than once." The online firestorms against him, he suggests, have made him less receptive to his critics. Others have taken a different approach. Spokane NAACP President Phil Tyler also saw the controversies erupt around Fagan and other leaders. But instead of condemning him with a statement, he invited Fagan to speak before the NAACP on Tuesday regarding his incendiary comments at the Spirit of America rally. He also invited Sheriff Ozzie Knezovich — who blamed Barack Obama's rhetoric for the spike in ambush-style killings of police — and Spokane County Prosecutor Larry Haskell, an ardent Trump supporter, to speak at the meeting. "I'm about calling people in, not calling them out," Tyler says. Tyler says that in the world of activism, there are "resisters" and "engagers," and each has value. "The resisters do a good job of bringing attention to the issues and concerns that otherwise wouldn't come to see the light of day," Tyler says. But once the public spotlight begins to fade, Tyler says, there needs to be engagers: People who bring the community together and seek solutions. In recent weeks, Lemus has moved in that direction. He met personally with Cates last Friday, outlining his objections to Fagan's comments, explaining why he decided to stand up, and suggesting that there were pieces of the HRC agenda — like human trafficking — that Republicans could get behind. He plans to meet with Fagan as well. Fagan says he's more than happy to have those sorts of conversations.